Nowadays, Holmen is an idyllic place of trees, birds, beautiful buildings and green embankments – but it was once Denmark’s busiest workplace. The new kayak route through the Port of Copenhagen is also a journey through a slice of military history, as well as a safe alternative to the harbour entrance, with its heavy traffic. Kayaking has become one of the most popular ways of seeing Copenhagen while also getting in some exercise. But the harbour can be a stressful place to kayak, a bit like cycling on a motorway. So it was a dream come true for many kayakers when the Blue Route opened in 2013. 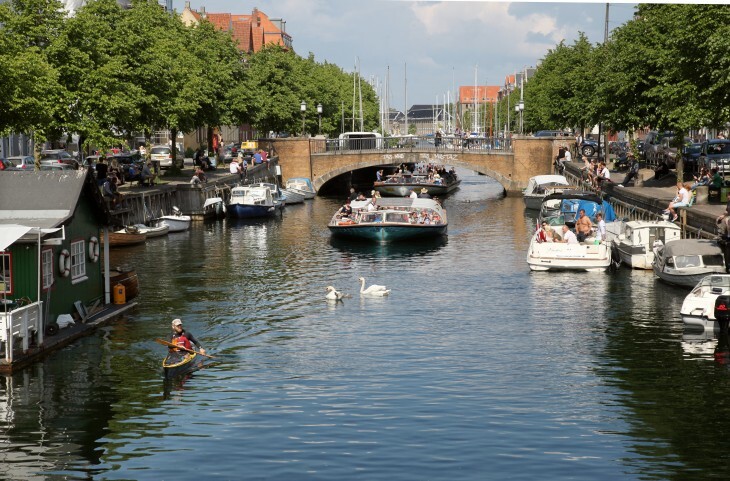 It runs parallel to the harbour for six kilometres, from Toldboden in the north to the Black Diamond in the south, but in the far more peaceful waters behind Holmen and through the Christianshavn canals. The dream didn’t fully come true – that would have involved removing the two dams that block the sea route. Instead, slipways were installed so kayaks can be dragged over the dams. But it is still a marked improvement on the past. The route has the added bonus of being a beautiful trip through a historic neighbourhood that has only recently been opened up to the public. Starting in 1690, Holmen served as a naval base and dockyard for 300 years. The pride of the Danish Navy was built here, and the whole area was dedicated to building and servicing the fleet. Many dilapidated traces of those days remain, but when drifting by in a kayak, you get a feeling of serenity and a sense of how green the area has become. Kayaking and sailing on boats small enough to be dragged over the slipways. There are plenty of places to go ashore. If you don’t have your own kayak, there are several places to hire them. Alternatively, sign up for a guided tour. Holmen was officially closed as a naval base in 1993, but the fleet still has a base in the area and the Navy’s military academy is still located there. Many breeding waterfowl, including swans and coots. Try not to disturb them in the breeding areas. Dragonflies are seen hunting above the water and the area is generally good for insects; a number of rare species are found here. Several places on land serve food. Some of the cafés even have moorings.